I use dock panel as filter,it works fine. 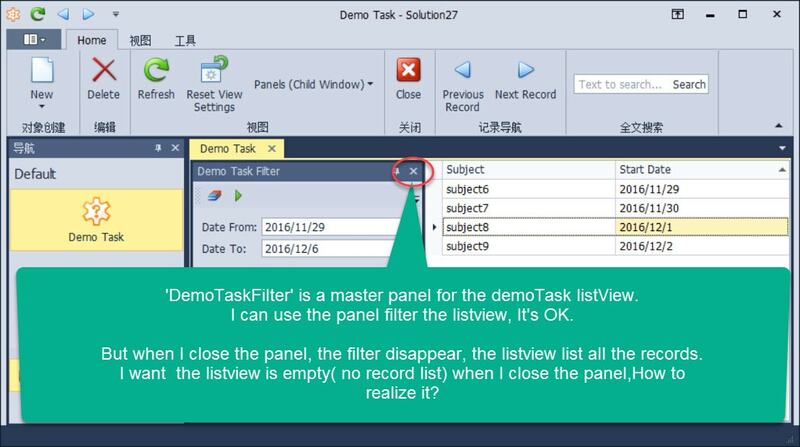 But when I close the panel, the filter disappear. and the listView display all records. I want the listView is empty(no record list) when I close the panel. How to realize it. Attached is the picture and my solution. Thanks for the additional information! We are working on your issue and will get back to you as soon as we can. You can manage a criteria in a code this is one of ways of solving this issue. Please see attached controllers for you project (you can correct and set the criteria as you wish).